How I ended up running a beer week by mistake — Will Hawkes. I wasn’t surprised that Dawn Leeder, founder of Norwich City of Ale, won an Imbibe ‘Innovator of the Year’ award this week. As the co-creator of the UK’s first beer week and of British Beer Cities, which aims to promote similar events all across the UK, she surely deserves it - not least because running a beer week is one of the most dismal experiences there is, this side of discussing Brexit on Twitter. That’s my view, anyway: it’s possible that Dawn feels differently. I’m pretty sure she does, actually: we met in November 2017, when she was planning the first British Beer Cities event, and shortly after the final London Beer City, which I ran for four years. She outlined her ideas and although I was impressed by her vigour and imagination, I soon decided that I wasn’t going to be involved. I’d had enough of beer weeks by that point. It had all been a terrible error. I should have known that I was doing something very stupid before I started; I’d asked around to see if anyone else in the London beer demi-monde was interested in helping, and got a series of responses along the lines of “Good idea! No, sorry, I’m too busy,” generally from people with enough time to be discussing the idea with me in a pub in mid-afternoon. Not only that, but I was never really sure why I was doing it: it just sort of kept on happening, for four long years. Did I want to highlight the growing quality of London-brewed beer? I was doing that already, particularly with Craft Beer London. Did I think good pubs deserve to be recognised? Sure, but not enough to devote weeks of my time running a festival, basically unpaid, to promote them. I could have just set up a blog (and now, hallelujah, I have). The atmosphere was mixed. There was another brewer who looked daggers at me throughout: I’m still not sure what I’d done to offend him. Perhaps he thought I was going to make millions out of a beer week, a concept that became more and more laughable as the years went by. Others, though, were more supportive, particularly Paddy Johnson of Windsor and Eton Brewery, who got behind LBC with his considerable energy and powers of persuasion. John Cryne, the genial secretary of the LBA and long-time Camra stalwart, was also very positive and helpful. There’s no chance it would have happened without them. The first year was quite fun. There wasn’t a great deal of expectation - how could there be with two months’ preparation? - and things went off reasonably well. Some events were busy, others less so. The highlight was an evening spent with Andy Moffat, owner of Redemption, Martin Harley, owner of London Village Inns, and my good pal Gordon Smith - who designed the programme - at a Redemption tap takeover at the Jolly Butchers. But it was the sort of evening that could have happened without London Beer City, a point not entirely lost on me. The next year, things got a lot bigger - but the key frustrations of running a beer week, and my fundamental unsuitability for doing it, became clearer too. I was constantly chivvying people along and waiting for promised ideas to materialise. It became stressful. I was always too focused on writing work - which paid my bills, just about - to be as organised as I needed to be. The best beer weeks around the world are run by committee and make great demands of those taking part in terms of submitting events for inclusion: Melbourne’s Good Beer Week requires registration six months ahead of the event. I think I managed six weeks, at best. (I suspect that London, too, is probably too unruly for that Melbourne-level of management; it’s a just-in-time sort of city, too diverse and sprawling). On top of that, promoting it made me feel unclean. You can’t run a beer week, with all that entails, AND be a journalist covering beer: the two things are fundamentally at odds. It also gets dull quite quickly: although some pubs and breweries were brilliant, others reproduced the same not-that-exciting idea year after year. Oh, and did I mention that it was a lot of work for no money? It’s not like London needs any extra attention, either. In other places - like Norwich or Exeter, where an event is apparently brewing - I can see the point of a beer week, to raise awareness, but most people, whether they like it not, are well aware of what’s going on in the capital. And in London, what does a beer week really add for the average beer drinker? There are interesting events, big and small, every few weeks. By the end of 2016, the third year, I was pretty clear that I didn’t want to do it on my own again - so I enlisted help, in the form of a team made up of Doreen Joy Barber, Matt Curtis, Jenn Merrick and Anselm Chatwin. I was hugely grateful for their help, and it made for the best event we’d had. But I still didn’t want to do it again. It wasn’t a complete waste of time. There were lots of good events, and it was quite fun at times. What did I learn? That organising big, complex events is not my forte; who you can trust in London beer; that I loath asking people for sponsorship money; and how impressive the likes of Good Beer Week, etc, are. My limited experience of running a company has given me a lot of respect for entrepreneurs, too, particularly those who start with very little. 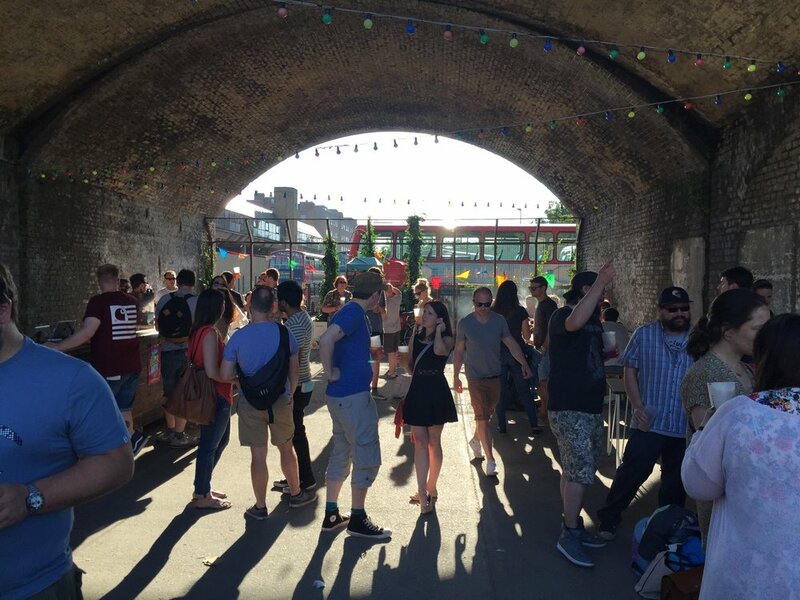 I knew it was over when, a few weeks after the 2017 event, I got an email from a South London brewer, moaning about the fact that his beer hadn’t been available at the closing party in East London. He’d won awards, apparently - well, haven’t we all? Not entirely to my credit, I decided not to reply; it was no longer my problem. And that produced a huge wave of relief that I can still feel today.